Set in the hill top village of Montauroux, this traditional French villa offers a secluded haven away from it all without being out in the sticks. Montauroux offers a range of traditional French restaurants and cafes, as well as fantastic local butchers and patisseries. It is also 10 minutes drive from idyllic Lac Cassian. Being 45 minutes drive from Nice Airport and Cannes, it is not only ideally located but situated in a picturesque location with stunning mountain walks close by. Dine al fresco on one of the sunny garden tiers amidst a grove of 30 mature olive trees, part of a 300 year old olive grove, as the sweet aroma of lavender wafts around you. In the evenings, turn on the lights that drape over the trees and talk until the early hours drinking the local wine in the evening warmth. The beautiful garden landscaped into a graduated levels creates a rustic setting for sunbathing around a large 12m x 7m totally private and exclusive oval pool, great for the kids or doing some lengths of the pool for exercise. There are 2 off road car parking spaces. The house is set on a 2500 m² plot, with 3 double bedrooms, two bathrooms, a 4th dining room/playroom and fully equipped kitchen, is ideal for both families and groups of friends or couples abroad. It is a rare property in the area where most properties for rent are modern and therefore naturally lack the same character as a traditional villa where part of the house is in fact a 200 year old shepherds cabin with 2 foot thick walls and floor boards that separate the bedroom from the downstairs area where the sheep would sleep at night. Outside you will find plenty of space to play for the kids, a table tennis table, boules area and badminton court where you will find a chill out area to sit. On the next tier you'll find an orchard with apple trees, a walnut tree, fig tree and a peach tree amongst two younger olive trees. For those of you with dogs, they are very welcome. The property is completely fenced in and there is no danger of them escaping. A walk through the forest is on the door step. My own dog loves it here. For eating out, you'll will find a great patisserie on the square for fresh pain au chocolat to go with your cafe creme at one of two cafes. For lunchtime and evening you'll find 3 restaurants in the village serving excellent food at a good price. You will note the beauty of the house as you look through the photos and that is exactly how you will find it in reality. Hi there, my name it Tom Moriarty and I'm a musician, writer and voice over artist. I live here with my dog Watson. The house is a true sanctuary away from it all. I have written many songs here that are now on albums that I've released globally. Equally the local surroundings are beautiful and inspiring. Each day I visit the nearby rivers, the forest or the lake. For adventures a little further away I chose this location because it's 40 minutes to the beach and 50 minutes to the nearest ski station, Greoulieres. You'll have a great time here. - The property is on the edge of the village for it to be quiet and tranquil however it is still just a few minutes drive to the village square - Montauroux is perfectly positioned between the mountains and the sea. Cannes is 45 minutes away as is the nearest ski resort in Greoulieres. - It is very private. The house is "hidden" from the road and the pool is not overlooked. - It is very dog friendly and secure. The whole property is surrounded by a 4 ft 7" fence which will prevent even the most eager dog or (young child in fact) from trying to make an escape. Equally there is no problem bringing your dog into the house. - It is a large pool great for the kids but big enough for doing lengths. - It has a beautiful garden set in a tiered olive grove - It is very competitively priced given the space, the location, number of rooms, size of garden and pool. You will not find something this beautiful or traditional for this price. This house is truly a traditional villa which you will find very hard to find elsewhere. It is full of character and charm and a beautiful place to stay. It is set in an olive grove with 28 trees under which you can lounge in the summer. The pool is set in an orchard with cherry, plum and quince trees that provide shade for your sun loungers. It is a large pool, ample enough for swimming lengths in the morning and great for the kids. The whole property is securely fenced so there is no worrying about children or pets making a run for it! The dining area is on one of the Olive tiers and is perfect for long evenings enjoying a relaxing dinner and conversation with friends and family. Opposite the property is the entrance to a wood where you can easily walk the dog or wander with the family for a short walk. Of course the forests of the Var are not far away and Lac St Cassien is a few minutes drive away. If you like the beach then it's a 30 minute drive to Cannes and the Esterel coast where you'll find the secluded "secret" beaches off the coast road. Dining in this part of the world at that time of year is almost always outside however if it is does rain then you can eat in the dining room which is the lower part of the old Bergerie. The house is set in an old olive grove with 9 tiers, so it's perfect for various play areas. There are many olive trees and also cherry, peach, quince, plum and apple trees. It is fully fenced. Greoulieres is a superb little resort and about an hour away, perfect for a day ski or a weekend. There are local courts in Montauroux. It is a totally private pool that belongs only to the property. It is a large pool and not overlooked so perfect for you and your family. Absolutely stunning place. Totally unspoilt and relaxing. We had the most lovely holiday. The house ticked all the boxes for me and my family. 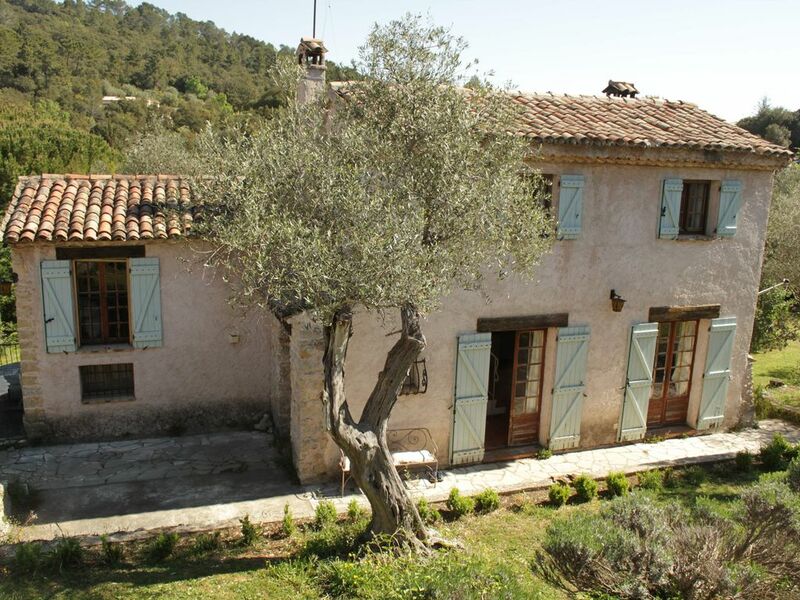 Small but charmingly decorated, set in an olive grove but not too far from the village. The children spent hours in the pool, the cicadas chirped and the sun shone. The kitchen was well stocked but we bbq-ed every night. It was close enough to coast, so we explored Grasse and went to aqua-splash in Antibres. Delighted you had a lovely time. It was a pleasure to host you and you are very welcome to return anytime! Hi there Detlef, thank you very much for your review and I am glad you had a great time at the house and that you found it to be romantic. As far as "Mücken" are concerned well in this part of the world mosquitoes are to be expected... I hope they did not distract you too much from enjoying the pool, the beautiful surroundings and the beautiful weather. Just North of Lac Cassien, Montauroux is ideal to explore the narrow streets of the medieval Old Town or just to relax in local restaurants and cafes. Visit the ancient 17th Century church (which sometimes has evening concerts) or the town hall, or go on an idyllic mountain walk. This town offers all of the joys of the Cote d'Azure, but in an untouched, traditional French setting. It is a charming town without being too out of touch; far enough away to relax, but not too far to be bored. There is plenty to see and do in Montauroux itself, or hire a car and drive to nice or Cannes in 25 minutes. However, Montauroux has everything you need with exquisite local cuisine in the restaurants and cafes, as well as succulent meat in the local boucherie, or delectable cakes from the patisseries. UK newspapers are available in the shops daily. Complete with rustic local people and boule tournaments, Montauroux is the dream French holiday destination. Prices are entered for one week stays but shorter stays might be available if requested. Please contact us.